Lathan Goumas - lgoumas@shawmedia.com Savannah Kleiner(center) of Lake in the Hills tries to avoid getting wet as rain falls during the 2013 Miss McHenry County Pageant at the McHenry County Fair in Woodstock on Wednesday, July 31, 2013. Kleiner was declared the 2013 Miss McHenry County. Lathan Goumas - lgoumas@shawmedia.com Maculey Thomas(left), Brianna Plunkett(center), and Tobi Jo Gustafson peer out of their trailer after rain fell during the 2013 Miss McHenry County Pageant at the McHenry County Fair in Woodstock on Wednesday, July 31, 2013. Lathan Goumas - lgoumas@shawmedia.com Savannah Kleiner(right) of Lake in the Hills reacts as she is declared the 2013 Miss McHenry County during the McHenry County Fair in Woodstock on Wednesday, July 31, 2013. Also pictured is first runner up Jessica Thuma of Woodstock. Lathan Goumas - lgoumas@shawmedia.com Contestants in the 2013 Miss McHenry County Pageant wait to be introduced during competition at the McHenry County Fair in Woodstock on Wednesday, July 31, 2013. Lathan Goumas - lgoumas@shawmedia.com 2012 Miss McHenry County Samantha Bolet(left), Brooke Romero(center), 16, and Olivia Wigman(right) wait for the start of the Miss McHenry County Pageant at the McHenry County Fair in Woodstock on Wednesday, July 31, 2013. Lathan Goumas - lgoumas@shawmedia.com Contestants in the 2013 Miss McHenry County Pageant sing and dance before the start of competition at the McHenry County Fair in Woodstock on Wednesday, July 31, 2013. 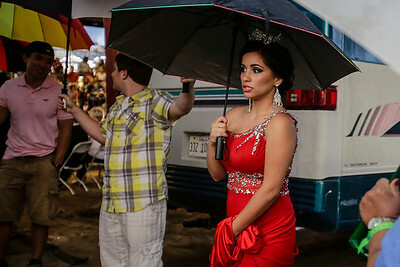 Lathan Goumas - lgoumas@shawmedia.com Miss McHenry County 2012 Samantha Bolet holds an umbrella to stay dry as she waits backstage during the competition at the McHenry County Fair in Woodstock on Wednesday, July 31, 2013. Lathan Goumas - lgoumas@shawmedia.com Caitlin Kauneckas, 17, of Crystal Lake ties to avoid a mud puddle as she is escorted back to her trailer during the 2013 Miss McHenry County Pageant at the McHenry Count Fair in Woodstock on Wednesday, July 31, 2013. Lathan Goumas - lgoumas@shawmedia.com Contestant in the 2013 Miss McHenry County Pageant talk back stage during competition at the McHenry County Fair in Woodstock on Wednesday, July 31, 2013. Lathan Goumas - lgoumas@shawmedia.com Contestants in the 2013 Miss McHenry County Pageant sing and dance backstage during competition at the McHenry County Fair in Woodstock on Wednesday, July 31, 2013. 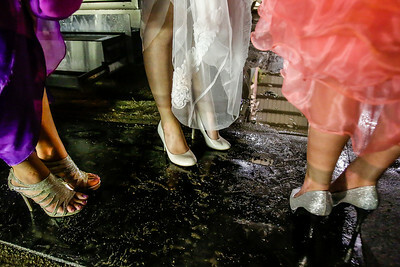 Savannah Kleiner(center) of Lake in the Hills tries to avoid getting wet as rain falls during the 2013 Miss McHenry County Pageant at the McHenry County Fair in Woodstock on Wednesday, July 31, 2013. Kleiner was declared the 2013 Miss McHenry County.